When you have several drawings that will use exactly the same rig there is a special naming rule you need to follow so that the same rig is linked to these different drawings. This can happen when you have drawing substitution in this layer. You should rename your extra drawings BEFORE rigging the main drawing of your element. If you do not do this an unnecessary subgroup will be created for each extra drawing—see Renaming the Drawings. Once your drawings are correctly named, you can start the rigging process. 1. In the Timeline view, make sure that the time marker is on the first frame, or the frame displaying the main drawing. 2. In the Network view, select your element’s module. 3. In the Deformation toolbar, select the Rigging tool. 4. In the Rigging tool Tool Properties, set the mode to either Automatic , Curve or Bone . 5. In the Camera view, build your Curve or Bone deformation chain. Refer to Rigging the Parts. 6. To switch to the next drawing or press [G]. You will notice that the subsequent drawings that are part of the link already have a deformation chain. This is the same as you just created for the main drawing. 7. 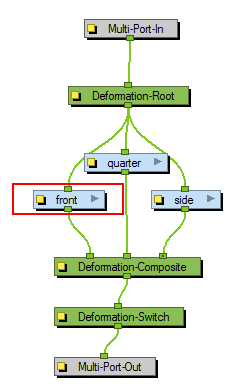 If you look in the Deformation group of your element in the Network view, you will notice there are no subgroups created for the extra drawings, they are all automatically linked to the main drawing’s deformation chain.